The last time I visited California I stopped by a Malibu supermarket. I was surprised to find a large number of coconut products prominently placed for sale. Coconut milk, cream and oil. But it was the way in which some were packaged that really got me thinking. Clearly Gen Y. But why would an oil that contains over 90% saturated fat be attractive to the health conscious gym junkie? A few weeks after returning to Australia, I received an email from Deborah Rogers of the Olive Press in Sonoma asking me if I knew anything about coconut oil. I think that all the hype surrounding VCO was getting to her as well. Well I have to admit that apart from knowing that coconut oil is a major and traditional source of energy for our South Pacific neighbors, I didn’t know that much about it, or indeed why it should be prominently placed in a Malibu deli. I promised Deborah that I would look into it – in particular why, something that on face value looked as healthy as a double B full of gamma irradiated lard should be even remotely popular. But I felt it would best to share. Coconut oil comes in two types. Refined and unrefined the former is marketed as ‘coconut oil’ while the latter virgin coconut oil or VCO. VCO is obtained from the fresh kernel of the coconut by mechanical or natural means and without undergoing chemical refining. The oil is obtained by a method called wet processing whereby coconut milk is pressed from fresh coconut. A component of the milk is called coconut cream then separates under the action of gravity and the oil is extracted from the cream by breaking the emulsion. Typically the emulsion is destabilised by either heating, chilling and thawing, fermentation using Lactobacillus sp. or enzymatic processes. VCO are typified by being almost colourless with some having a roasted, cooked, smoky or nutty aroma, sweet taste and nutty flavour. However by volume, most coconut oil is refined. Refined coconut oil is typically made from the dried ‘meat of the coconut (called copra). The copra is ground and steamed, and then pressed either using a wedge, screw or hydraulic press to obtain a crude coconut oil. The crude oil is then bleached and deodorised. As with refined olive oil, refined coconut oil has no discernable aroma or flavour. Compared with extra virgin olive oil, VCO is relatively low in antioxidants. Tocopherol is only found in the thin brown layer that clings to the white coconut meat, called the testa. There isn’t much of it and it is removed before the oil is extracted, so only trace amounts of tocopherol is found in virgin coconut oil. The total polyphenols level of virgin coconut oil is a meagre 20-25 mg/kg (Marina et al. 2008). Compare that with EVOO which has a basement level 4 times that, and peaking at over 50 times the level of VCO (Gawel and Rogers 2009). In addition, the polyphenols reported in VCO are your common garden variety type. protocatechuic, vanillic, caffeic, syringic, ferulic and p-coumaric acids. Ok they sound impressive, but there’s nothing there that your average glass of red or white wine wouldn’t give you times 10. I’m sure there are very small amounts of other polyphenols in VCO which haven’t been reported yet, but to date it really looks like a pretty plain sort of oil, at least polyphenols wise. All of the common edible fats contain some saturated fat. EVOO contains around 10% saturated fat (the major fat being the monounsaturated oleic acid), while coconut oil contains a massive 90%. The figure below gives the average fatty acid profile of both oils. So what is the big deal? Why does an oil with enormous amounts of saturated fats and hardly any polyphenols or vitamin E like tocopherol get so much recent attention? There are a number of different types of saturated fatty acids. Most of them are pretty big molecules, consisting of chains of carbon atoms typically 16 to 18 long. These are called long chain fatty acids and are known to contribute significantly to coronary heart disease. The major ones are palmitic acid (16 long) which dominates that fat profile of palm oil (and fast food joints), and stearic acid (18 long) which dominates animal fats. On the other hand, VCO is dominated by smaller saturated fats called lauric and myristic acid. At 12 and 14 carbons long (respectively) they make up around 45-55% and 16-21% of its total fat content (respectively). What oleic acid is to EVOO, lauric and myristic acid is to VCO. Some people have conveniently classed lauric and myristic acids as medium chain fatty acids (MCFA), but to be realistic, as far as MCFA’s go they’re a bit on the chunky side. MCFA’s are officially defined as having chain lengths of 6-10, so lauric and myristic acid sit a bit in no mans land, a bit long chain, a bit short chain…. The classic MCFA’s are absorbed into the human body via a different mechanism than the longer chain saturated fats. They don’t need to hitch rides onto proteins like the long chain mob before they can be absorbed. They are transported directly to the liver while their longer chain counterparts are absorbed through the lymphatic system. This short-cut means that they get to where they need to go – express. MCFA’s became uber-famous when it was reported that you could eat them and you could lose weight doing so! Yes, eat fat and lose weight. The perfect solution to the obesity problem in the developed world – including, no doubt, Malibu! The reason for this rather counter-intuitive situation has a lot to do with the fact that MCFA’s are absorbed in very different ways than conventional long chain fats. But as often is the case, the devil is the detail. Medium chain fatty acids DO increase fasting cholesterol and triglyceride levels when consumed in moderate to high amounts – just t like their long chain counterparts. In their excellent but ‘not for the faint hearted’ technical review of MCFA’s Marten et al. (2010) stated that “the amount of MCFAs that can be tolerated within one meal is limited to 25–30 g. Ingestion of larger amounts of MCFAs causes adverse gastrointestinal symptoms, including nausea, vomiting, bloating, gastrointestinal discomfort, abdominal cramps, and osmotic diarrhoea.” OK, they were referring to the 6-10 chain length group of MCFA’s. Whether the dominant saturated 14C fatty acid in coconut oil has the same effect is unknown. Maybe, lauric acid doesn’t upset your tummy, but then again maybe it doesn’t confer the same health benefits either. At 175-180C, VCO has a lower smoke point than good extra virgin olive oil. The lower smoke point of VCO results from the dominance of short chained fatty acids. When oils smoke, it’s not the intact fats that are doing the smoking. They’re relatively heat stable. It’s the free fatty acids which are found in all virgin oils that smoke first. As a general rule, free fatty acids with a shorter chain length start to smoke at a lower temperature. 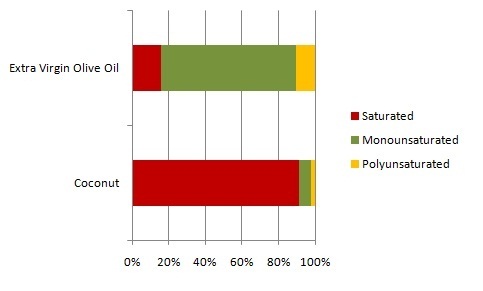 Refined coconut oil on the other hand has a higher smoke point which is comparable to that of other refined oils (as all the free fatty acids are removed by refining). Personally speaking I’d prefer a bit of traditional mono stuff that you find in EVOO. No subtle coconut flavour, or bugger all polyphenols. And no guess work on whether or how good it is for you. I’d prefer the gorgeous olive flavour that lifts food to new heights- and the simpler the food, the greater the lift. (But you can stick the zillion mg/kg polyphenol EVOO into a Suisse horse tablet for the stressed exec. It tastes better that way anyway). Thank you for finally clearing this up for me, O-Wise-One! I’ll continue to consume coconut products in very small doses, and sitck to my usual healthy consumption of red wine, and of course EVOO! Hi Ginge – Good call. Whichever way you look at it coconut oil does contain fatty acids that olive oil and other edible oils don’t have, and mixing and matching different fats in your diet makes a lot of sense. Coconut oil in moderation is being recommended as a suitable fat for use by people with chronic weight issues. But I’ve heard on the olive grape vine that you are a bit on the scrawny side so it probably doesn’t apply to you. Just saw this smoke point chart on wiki showing virgin coconut oil with a higher smoke point than EVOO and refined coconut oil has the highest of those listed. Is this correct? Yes I’ve seen the compilation on wiki, which was sourced from a few different websites, but it is unclear as to where the original information came from. But despite this, all the websites give the caveat that the actual temperatures given should only be taken as a ball park. It is good advice. Smoke point depends a lot on the level of free fatty acid in the oil, and on the dominant type of fatty acid that the oil contains. I’ve covered this in detail in an earlier blog. I’ve edited this one to clarify why virgin coconut oil can smoke at a pretty low temperature. Hope this helps. Wow, what an utter lack of research. Virgin Coconut oil and extra virgin olive oil are both extremely healthy in different ways. In fact, I’d go so far as to say virgin coconut oil is healthier. But of course, the author being an EVOO consultant taster, one can see where this prejudice comes from. Lol. “Utter lack of research” simply isn’t consistent with the fact that the post was based on very solid and extensive review articles published in regarded refereed scientific journals. That is a lot more than can be said for all the other stuff out there on VCO. Lots of talk and dare I say hubris about this or that new super oil, but usually with little or no supporting evidence for the claims that are being made. I searched for “Virgin Coconut Oil” into the premier academic database “Web of Science” by Thomson Reuters today with a specific search for Nutrition/diet articles. Time period= all time. This is the preferred database of university researchers. Seneviratne et al. (2008) – hot extracted VCO contained more phenolics than cold extracted (as exected, but still very little cv EVOO). Nevin and Rajamohan (2005) VCO reduces oxidative stress compared with copra oil and peanut oil. Hardly a lot of evidence for the claims often made about VCO I would suggest. But if you think I’m missing something (other than hearsay) about VCO please feel free to share. You might also like to read my replies to other posters re using different oils in a balanced diet. Yes I’m pro EVOO (that’s the point of the blog), but I’m happy to give credit where credit is due but only if I can find solid evidence. The claims for VCO as a health food are entirely based on population-level studies, very short-term studies on a limited set of risk factors, and other weak forms of evidence. There are no long-term studies tracking the health of individual people consuming VCO as their main source of fat for many decades, nor multi-year clinical trials, as there are for EVOO. At best, the healthfulness of VCO remains unknown; at worst, the epidemiology on other sources of saturated fat suggests it may be harmful, although the short-term studies on VCO suggest that it may instead be neutral. But until the long-term studies are done, we really won’t know, and it’s premature to be promoting it as a health food. As a pioneer in virgin coconut oil, I agree that there are much researched to be done. In fairness, people like us want to do that but here is the problem: Most universities (in fact 14 that I approached in 1998) won’t do it. You can get a private lab but that will kill the purpose. As a result, you just need to use studies done in MCT and make a correlation from it. Unfortunately, most of the vendors don’t know about science so they just copy directly what’s in MCT literature. For the time being, perhaps we can use anecdotal evidences but it should be used properly as not to appear as snake oil. As of processing, I just want to let you know, that there are a lot of varieties in virgin coconut oil as opposed to olive oil. In virgin coconut oil, you have the wet and dry process. Then, there are still several types within the two methods. In general, you don’t remove the testa in wet process as it contains about 15% of the oil. There are very few that use white meat in wet process and those are not backyard processing. As of smoke point, coconut oil varies depending on purity e.g. moisture, FFA, non-oleaginous components. In other words, some virgin coconut oil will have high smoke point same as refined oil and to certain extent you can make one higher than refined. I have an unpublished book about virgin coconut oil processing (varieties and differences). I decided not to publish it for valid reasons. At the end I am with you that further studies has to be done. This statement made me a villain within the virgin coconut marketers. BUT I was trained in science and technology so I don’t know how to speak the marketer’s lingua. Hi – I decided to edit out the dozens of health claims you mention as none of them can be substantiated, and publishing such claims can be counterproductive at best and dangerous at worst. And incidentally any fat would be safer than trans-fat. Thank you for your thoughtful comments. I could imagine that getting funding to research the possible health benefits of coconut oil would be difficult as it isn’t that commercially important, and the universities in the countries where it is grown probably aren’t that cashed up. However, the fact remains that to date, the energetic claims made about it are largely not backed up with any science. I’ve recently learned that despite its health benefits, EVOO needs to be fresh and treated very gently in processing to retain benefits and even then more than one year after processing, most polyphenols found in olive oil are too broken down to be useable. VCO on the other had may have less polyphenols to begin with, but it’s a much more stable substance, especially since it is frozen at room temperature. So the questions is, on the long term, is coconut oil worth? I use it a lot, especially in cooking (research has led me to understand that olive oil should only be consumed raw to retain its qualities and in any case, coconut oil burns at a much hotter temperature) and I can’t find anything one way or the other about the health benefits or risks of using coconut oil. There is a fast growing community of scientists contradicting conventional wisdom on saturated fat. As controversial as it is, it’s hard not to respect their thoroughness. This article is certainly worth your time. Although you may disagree with some of what it says. Chris Kresser presents some really interesting information. And here is a more recent article on the matter. Chris Masterjohn, from The Daily Lipid, has a lot to say on the matter as well.